There are numerous systems of medicine that exist in the world today: Chinese medicine, Ayurvedic medicine, Tibetan medicine, Western herbalism, American Indian medicine (with all its variations), rainforest herbs / Amazonian medicine, Australian aboriginal medicine, Hawaiian / Pacific islands medicine, etc. Every such system of medicine is primarily based on the medicinal properties of plants that grow naturally in local regions. Australian aboriginal medicine, for example, is based on the numerous desert plants native to the Australian continent. Tibetan medicine is based on the medicinally-potent plants that grow in the harsh, high-altitude environments of Tibet. And Amazonian medicine is based on the abundant biodiversity of natural medicine found in rainforest botanicals. Realize that every system of medicine has a treatment for breast cancer. In the Amazon rainforest, such treatments might include the Una de Gato herb (also known in Western herbalism as "Cat's Claw" and widely used as a potent anti-cancer medicine). In the regions we now know as the American Southwest and Mexico, treatments for cancer utilize tea made from Chaparral bush leaves (also known in modern times as the "creosote" bush, from which leaf oils were extracted in order to coat railroad ties). In Chinese Medicine, cancer was approached from a different point of view: the Five Element System, rather than the traditional allopathic paradigm of the West; treatment protocols might include a "recipe" of various medicinal herbs with a synergistic effect that work to strengthen and support the body's innate anti-cancer protection mechanisms. In other words, if you were to travel the world in search of treatments or cures for breast cancer, you would find hundreds, if not thousands, of such treatments spanning diverse cultures, geographies and medical paradigms. And these treatments really work: modern scientists are increasingly discovering that these native cancer remedies contain identifiable anti-cancer compounds that work in a myriad of ways. They might cut off the blood supply to cancer tumors, promote cancer cell apoptosis (cell death), block the replication of cancer cells, boost immune system function and so on. There are literally thousands of different treatments for breast cancer used in various cultures around the world. Many, such as those in Chinese medicine, are meticulously documented and are based on thousands of years of research and clinical experience. Countless lives have been saved by these cancer treatments and cures from around the world. 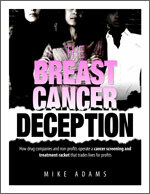 Yet the western cancer industry, comprised of cancer clinics, drug-company-funded cancer non-profits, pharmaceutical firms, hospitals, doctors, medical schools and medical journals, actually goes out of its way to deny women access to this information and wisdom about treating or preventing breast cancer. The only thing women are taught is the conventional view, which is based primarily in harmful treatments: chemotherapy, radiation and surgery.